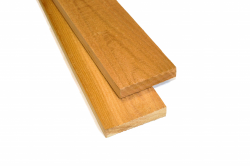 Rough sawn, unseasoned boards or boards surfaced on one side and two edges (S1S2E) are commonly used for board-and-batten siding. Sizes are from 1x2 to 1x12. Rough sawn, unseasoned boards or boards surfaced on one side and two edges (S1S2E) are commonly used for the "batten", or the top layer of siding. Sizes are from 1x2 to 1x12 and can be interchangeable with boards, depending on the appearance desired.